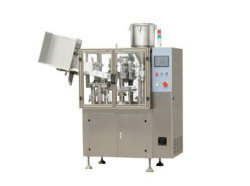 A Global Supplier of Packaging Machines and Processing Equipment. 3.PLC + touch screen control, color graphics interface, man-machine dialogue. 4.Adjustable speed control positions accompanied by (also adjustable swing angle) the entire series manipulator, control devices and vacuum generators to supply accurate and stable hose). 5.handrails in a vacuum on the tube under the action of turning about 90 º, the hose is pressed into the elastic tube station on the tube cup. 6.Photoelectric on standard workstations with high-precision color detector,stepper motor control patterns in the correct position hose. 7.filling nozzle according to the characteristics and quantity of filling material to determine its size, can provide the form of a blow off nozzle type, style and blow off all of comprehension. 9.Sealing much more flexible manipulator can be adjusted through different to achieve the end of the second fold, three fold and saddle-shaped tail end off. 10.type code code print workstation automatically requests the position in the process. 11.Standard: saddle-shaped folded sealing device can achieve by adjusting the folding and fold sides of the trilateral. 12.Standard: Xiegua automatic feeding tube position matching the entire series: Laminated Barrel insulation device.